Cordell Bank National Marine Sanctuary was established in 1989 to protect and preserve the extraordinary marine ecosystem surrounding the Cordell Bank. Surrounded by soft sediments of the continental shelf seafloor, Cordell Bank emerges with a rocky habitat, providing home to colorful and abundant invertebrates, algae, and fishes. 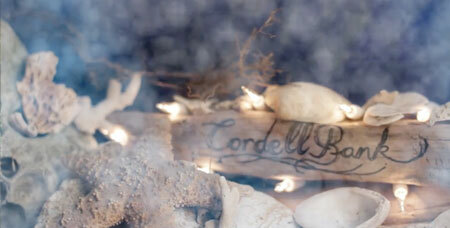 Cordell Bank is a fine dining destination for many, find out who? Click here for a downloadable video. Click here to view a high resolution version on YouTube. Cordell Bank: A National Treasure - A mesmerizing glance at the diversity of marine life that visit Cordell Bank or make it their home.Click here for a downloadable video. Click here to view a high resolution version on YouTube. 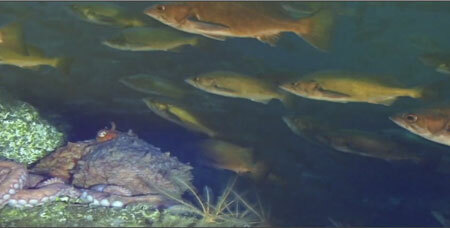 Meet the animal that truly is the cash crop for the ocean waters within Cordell Bank National Marine Sanctuary. Click here for a downloadable video. Click here to view a high resolution version on YouTube. This hand-drawn short film was created by Drew Christie. Recycling and reducing waste is a significant way to reduce the threat of marine debris and reduce carbon dioxide emissions that contribute to a warming planet. With an unprecedented loss of kelp coverage on the Marin/Sonoma coast, the State Fish and Wildlife and Greater Farallones National Marine Sanctuary worked with experts to create a plan to understand the issue more and look to ways to protect and restore this vital habitat to the best of our abilities. The Honorable Dr. Jane Lubchenco gave a lecture titled Hope for People and the Ocean at the SF State Estuary and Ocean Science Center in November, 2018. Listen in to hear about how policies have worked to bring overfished fisheries back and how new collaborations bring natural and social scientists together to focus on problems facing the ocean. Positively Ocean at the end focuses on how elephant seals have rebounded and how the Point Reyes National Seashore is working to protect them and humans from their presence on beaches. Positively Ocean Episode: Elephant Seals make a comeback!